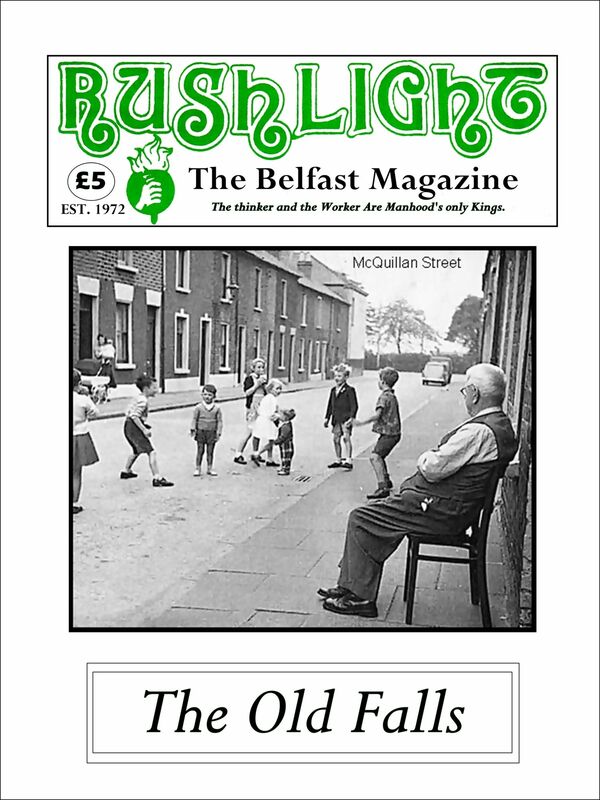 Rushlight Magazine Belfast's Oldest Historical Publication, Belfast Born Bred And Buttered. Joe, I apologise in advance for what the length of this ‘post’ but it is one which I have been moved to make having read your fascinating and candid attempts to uncover and share with your readers, the hidden history of this land. I recently decided to go ‘out and about’ and visit some of the places of interest which you have written about here on your website. I’ve driven through or past some of these small villages and sites many times previously - shamefully oblivious to the crimes against humanity that were committed there. Thanks to you Joe, and your own tireless efforts to shed the light of truth on our dark and sorrowful history, I, and hopefully many others, have been informed and enlightened as to the reality of what actually took place in certain parts of County Antrim. Events which served no purpose but to degrade Irish people and displace them from the homes they had built on rich and fertile Irish soil. Influenced by your own recollections I went to Carmavy and also to the lush beauty of the countryside at Ballynure and Ballyeaston. Standing in the silence of the small graveyard at Carmavy, one can easily bring to mind the cruel and barbaric actions that were inflicted upon an unsuspecting people by Arthur Chichester and his army. Picture in your mind the men, the fathers who could not protect their families from the black hearted yeomen. Picture the women, the mothers who could only watch in horror as their husbands and children were brutalised and killed before their gaze. If you listen with your heart as you stand in those places, you can almost hear their screams; their pleas for mercy. No mercy was shown. Picture the aftermath - the desolation, the realisation that you have been stripped of everything you once owned, everything you held dear, forcefully evicted and ejected as an object having no value or use. How did they survive? What was it that caused the embers of resilience to grow into a burning flame of sheer determination and defiance? The English may have broken their bones, but they failed to break their spirit! In our own recent battles to address the British invasion which continues today, we have taken great pride in holding up the heroic efforts of those we hail as our patriot dead as an example of how we too must persevere in the face of opposition and defy those who wish to oppress. We commemorate historical events which have been deemed ‘worthy’ of remembrance. Yet we have no little plaques on walls, no iconic memorials in place to honour those who gave so much so long ago. Are the events which happened under the bloodied hand of Arthur Chichester so unimportant that we want to hide them away? Are we ashamed to acknowledge what REALLY happened under the British? Joe, you have rightly described what happened as “Ethnic Cleansing”; today, such actions would cause international outrage. Many incidents of this nature which took place throughout Europe and beyond are remembered with a sense of horror yet here in our own land, the majority are ignorant of our own history. These events have been overlooked and brushed aside - why? What purpose is served in presenting history which is swathed in a cloak of grey silk? The ‘greying’ of our history serves no one. Today grey is seen as something bland or boring but there is nothing boring or bland about the history you have brought to light Joe. Too many important and vital details have been left out of our history books or watered down by those who are unable to deal with the historical facts. The past is not to be lived in but it is to be learned from. How can we learn if we are only given half truths and diluted accounts of our history? I find myself asking a question: Is Joe Graham the only historian passionate enough about the events which have shaped this land and the people on it; is he the only historian willing to stand up and tell us the truth? I’m not anybody of consequence Joe, just an ordinary citizen who happens to love this land and one who WANTS to know the real truth. I commend you in your own efforts to reclaim our history and share it with us - warts and all. 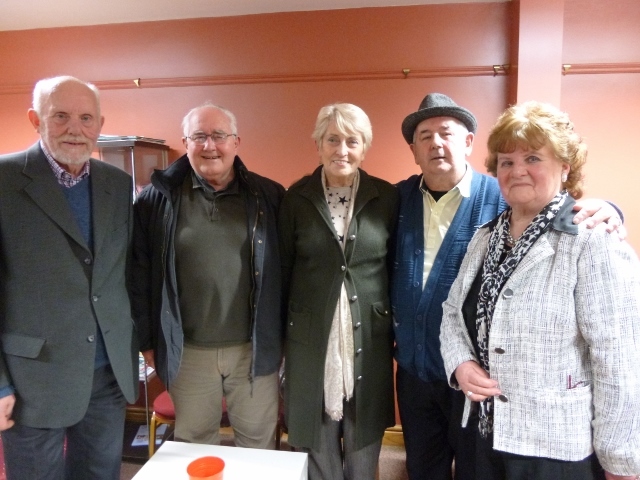 Brimming trips down memory lane, fascinating tales and ghost stories, Belfast’s oldest historical magazine, Rushlight, continues to celebrate the characters and events of the past. The brainchild of Andersonstown seanachie Joe Graham, the magazine is ever popular, attracting readers of all ages to its fascinating articles. Reading the magazine you become immersed in bygone days, getting to know the characters from the community and areas, many of which are no longer there, or have changed greatly. A fiery street orator Arthur Trew, who is regarded as a forerunner to Ian Paisley, is covered in great detail in January’s edition. The controversial figure, who died in the 1940s, became the best known of the speakers who gathered to give speeches at the steps of Custom House, Belfast’s Speakers’ Corner. Such was his popularity amongst unionists that when he lived in Dublin for a period a collection was made to pay for his train fare north to continue to give Custom House speeches. He flirted with more than just vitriolic speeches, when in 1901 he ended up in court charged with disorderly behaviour. He had obstructed a Corpus Christi march making its way to St Malachy’s College on the Antrim Road from St Patrick’s Church on Donegall Street which led to disturbances in the area. He received a 12 month prison sentence. Other Rushlight stories include the sad death of a mill worker crushed by machinery, and a daring escape from the Crumlin Road Jail in 1927. There is, as always, a great selection of photographs showing parts of Belfast at the turn of the century and some interesting pictures of the opening of St Kevin’s School on the Falls Road. 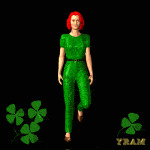 The people in the magazine are always very interesting but it is for the little gems along the way that many buy it. For instance we learn in the article about Arthur Trew that the deeds of Joe Graham’s own house in Elswick Street contained a clause to the effect of, “This property may never fall into papist hands”. The secret of Joe’s successful approach to history is his reluctance to rely solely on desk-based research. Joe is a people person and often uncovers fascinating details from speaking to elderly people and obtaining oral accounts passed down through generations. Joe’s love for West Belfast shines through the magazine and makes it a must buy for anyone in the community who enjoys a lively read. THE OLD FALLS is available on DVD! 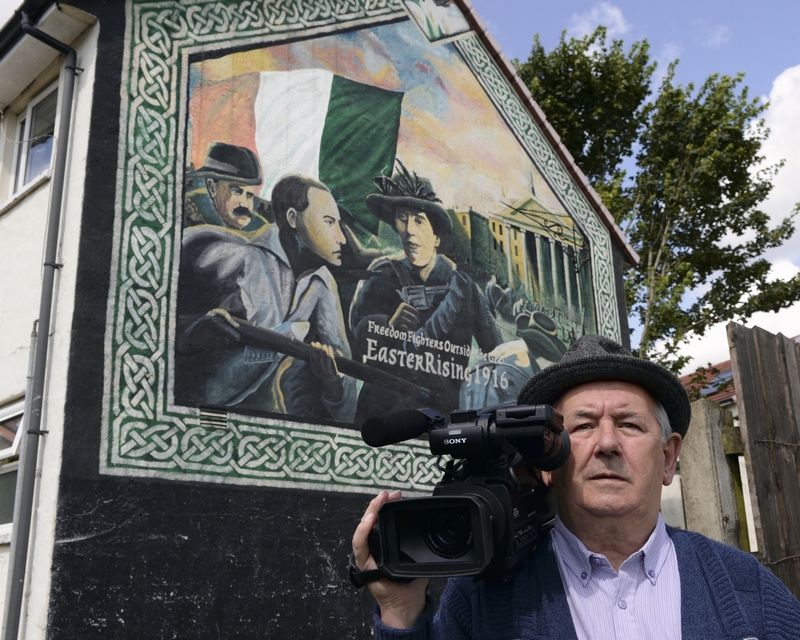 A walk down memory lane with Joe Graham ... through old Divis Street, the Pound Loney, Clonard and the Springfield. Featuring very rare video and photographs ... a memorable record of social history. 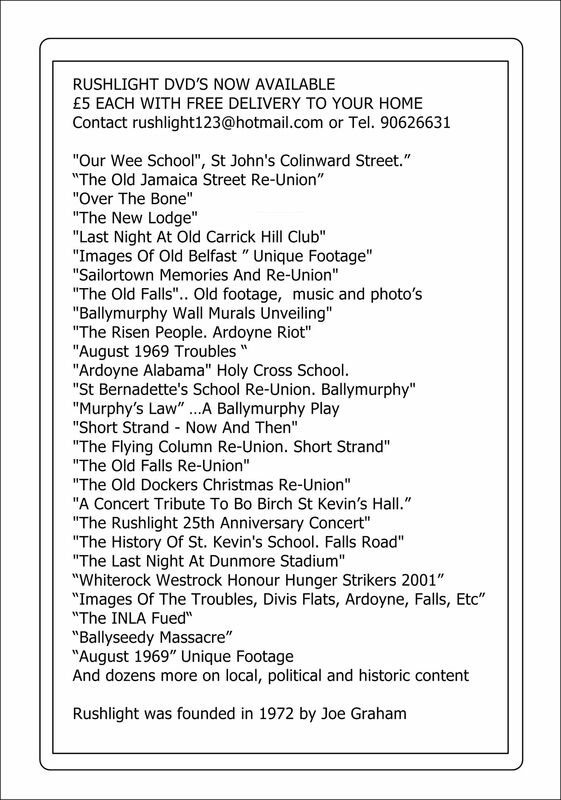 Welcome to the Website of "Rushlight The Belfast Magazine" which was founded by Joe Graham in 1972. From its birth Rushlight to protect its integrity to present history in a truthful , warts and all, way has been kept free of grants and funding from all and any sources. Some readers will recall that I have not only been involved in the Rushlight but many other local papers. I also edited and published the "Ardoyne Freedom Fighter " during the early troubles, plus "The Vindicator" for Clonard area, plus "Scale" for Ballymurphy.. and in the late 1960's "The Pike" the voice of republican Belfast.